This elegant slat back dining chair from OSP Designs is sure to bring an added dose of style to any dining room. Perfect for both busy kitchens and elegant settings, this chair comes designed with a grey metal seat and grey metal frame. Add comfort to your dining room with this transitionally styled set of dining chairs from CorLiving. This set includes two Rich Cappuccino stained wood dining chairs with Pewter Grey fabric seats. Constructed from hardwood and hardwood composite these chairsassemble with ease. Great value with exceptional style! Relax on the beautifully designed Catherine Dining Chair, perfect tucked under the dining room table or pulled up to the breakfast nook. Straight wood legs in a rich oak finish, give this piece an understated quality, with its unique chevron pattern offers texture and artful design. A Mid-Century modern classic, the Dover Dining Chair blends simple and seamless design to add a timeless and sophisticated appeal to your home. Quality craftsmanship and solid wood frame, keep this chair durable and functional, making it the perfect dining room addition. Lean back into the comfortable upholstery and enjoy family gatherings seated around the table or in the living room. Bristow Metal Grey Slat Back Armless Dining Chair with Grey Metal Seat - Set of 4 This elegant slat back dining chair from OSP Designs is sure to bring an added dose of style to any dining room. Perfect for both busy kitchens and elegant settings, this chair comes designed with a grey metal seat and grey metal frame. 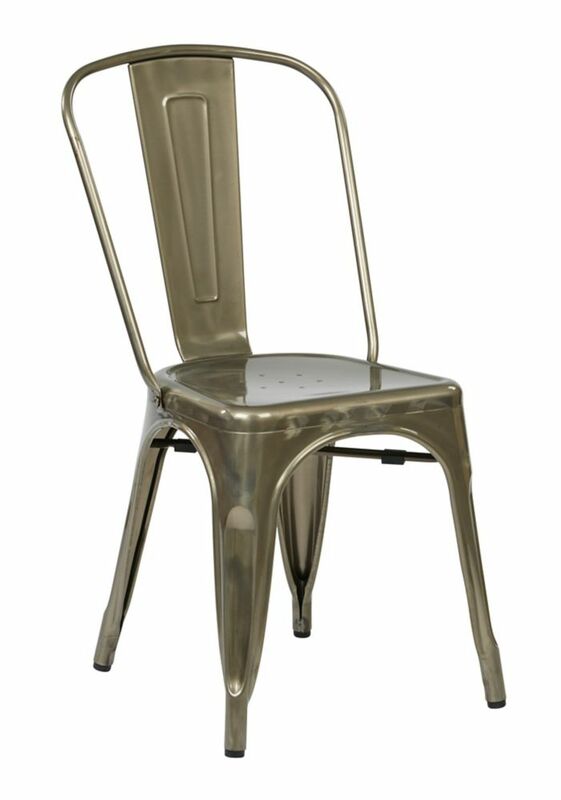 Bristow Metal Grey Slat Back Armless Dining Chair with Grey Metal Seat - Set of 4 is rated 5.0 out of 5 by 1. Rated 5 out of 5 by Tpw from Love These Chairs I needed 6 chairs to go with my reclaimed wood table so I purchased these unseen. I am very happy with my purchase! They are lighter than they appear on the computer but, they are not too light. The distressing is consistent on every chair and they are very sturdy. They come in a set of 4 so I placed the extra two chairs in my living room and placed two standard size pillows in each chair.